Scorpion venom has recently undergone an image upgrade…once feared, these little-studied toxins are now yielding valuable medicines. 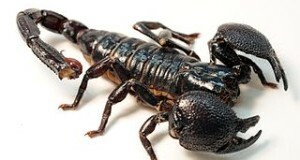 Researchers at China’s Wuhan University have recently (August, 2009) discovered 9 new types of peptides and proteins in the venom of Scorpiops jendeki, a scorpion native to southwestern China. Although considered only mildly toxic, S. jendeki’s venom is quite complex, containing at least 19 different proteins. Scientists believe that these molecules may be useful in synthesizing new drugs. Newly discovered molecules, which may attack cells in novel ways, are always looked upon with great interest by medical researchers working with incurable diseases and drug-resistant microbes. In recent years, even the much-maligned “death stalker” or Israeli yellow scorpion (Leiurus quinquestriatus) is being treated with new respect in the lab – an irradiated version of a protein in its venom shows great promise in the treatment of brain cancer. You can read more about current research involving scorpion venom and brain cancer at http://www.nano.org.uk/news/april2009/latest1847.htm. 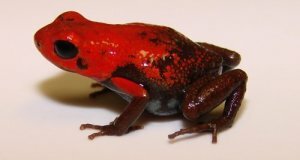 Frog Facts: New Species Has Fangs and Gives Birth to Live Tadpoles!